The venerable La Pubilla del Taulat, open since 1886, is the quintessential “little place one discovers”. 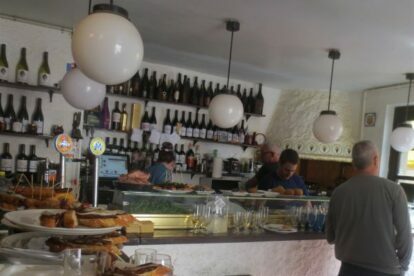 Harking back to the days when Poblenou was a fishing village and all they served was vermouth from one barrel and anchovies from another, this tiny venue is one of my favourites in the area. Nowadays you will find a delicious assortment of montados (slices of bread with artfully arranged toppings) and artisanal croquettes to die for, all made on the spot. When I say little I mean it, there are only three tables inside and some stools outside, but you can always stand at the bar and chat with owners Miguel and Toni as they prepare the next batch of heavenly tapas. The atmosphere is homely and animated – you just want to take a piece of it home, and thankfully you can. Next door is the bodega or deli and wine cellar where you can stock up on delicacies. Take a moment to admire the vintage wine barrels, period photos and antique bottles with the old La Pubilla house label. If time is on your side, get ask whoever is behind the counter to tell you the story of La Pubilla and talk you through the black and white photos on the wall.